I've been playing around in my studio with a few steamopunk inspired creations and this is what I've come up with. What do you guys think? Last edited by dragongirl on Thu Jan 20, 2011 12:34 pm, edited 3 times in total. Is that you with a Porpoise?! Yeah, I went swimming with an Dolphin at Epcot in Disney World. Is that an octopus attacking a heart? i want to see a bigger pic too! they look really intricate... nice work! I've added a slightly bigger picture. I need to take more photos of individual items as I'll be adding them to my website soon. They look good, if a little similar to other stuff. 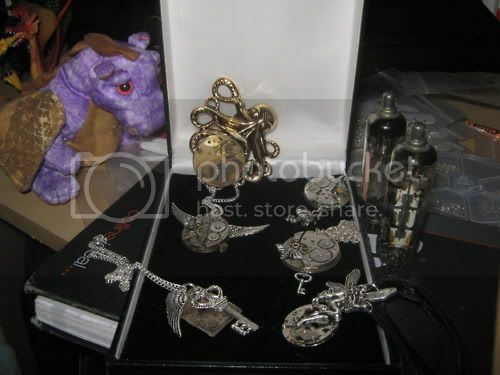 Just some constructive criticism, that octopus has become somewhat of a cliche in steampunk jewelry now, it's been used by pretty much everyone. Just search etsy for steampunk octopus and there are dozens of results using the same piece. I think the fairy is pretty common too. You might sell more if you make stuff using component pieces that aren't as overdone as the steampunk crowd is fairly big on being "unique". It'll also effect the sale value of these items too as people know you can get similar styles for about a tenner online.